It’s a ritual restaurant diners experience regularly: The bill arrives and it’s time to calculate the tip. But how? Should it be 10, 15 or 20 percent? And a percentage on what: Before or after tax? What about wine? It began as a straightforward attempt to solve a legal problem. While most restaurants’ reputations turn in large part on food quality, it was illegal in most of the country for a restaurant to require tip sharing between servers and cooks. The result was a great disparity between the compensation of front-of-the-house (waiters, bartenders, bussers) and back-of-the-house (cook and dishwasher) staff. At the legendary Chez Panisse in Berkeley, Alice Waters addressed this problem by adding a “service charge” to customers’ checks, enabling her to direct more compensation to the chefs without changing the menu price of dishes. Now, in addition to Panisse, prominent Northern California restaurants Benu, Saison, Atelier Crenn, Coi, The French Laundry and more have added a “service charge,” “guest-experience fee” or simply folded the cost of additional compensation into the menu prices. It’s happening in New York at Per Se, Dirt Candy, Sushi Yahada and Chef’s Table. And it’s happening at Alinea in Chicago, and restaurants in Philadelphia, Austin, Washington, D.C., and more. Wait staff often see it similarly. Edoardo Laquiz-Bianco, a top waiter at Del Mar’s Davanti Enoteca, says it’s essential that diners retain the power to reward good service. “It’s what motivates us,” he says. He does note that diners from non-tipping cultures see a “service charge on credit card forms and don’t know what it means.” Thomas and other waiters say having a fixed service charge would help them make more money when serving tables filled with diners from cultures that traditionally don’t tip even as much as 10 percent. Many diners assume that when they leave a tip the money stays with the waiter. The reality is different. 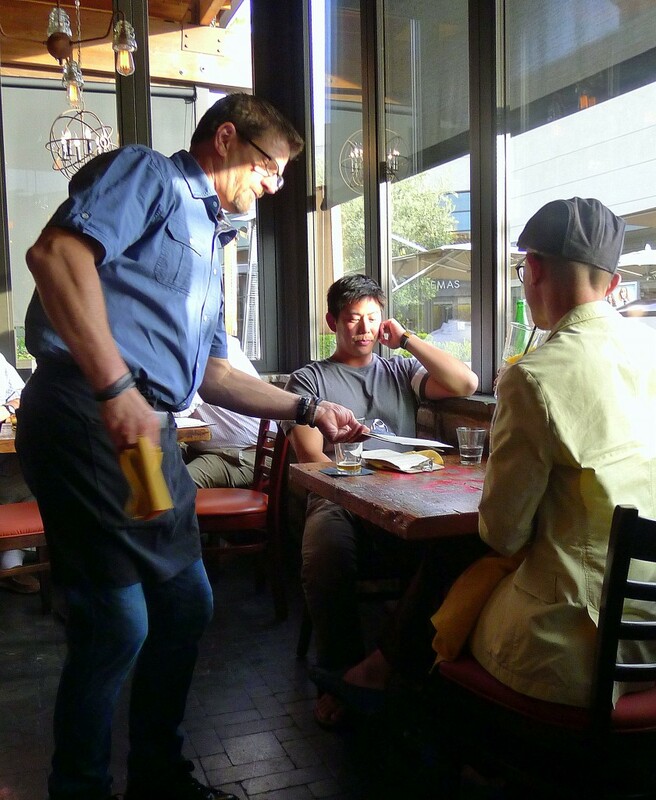 Nearly all restaurants implement some sort of “tip pool” or “tip-out” system under which varying portions of the tips are pooled and redistributed among front-of-the-house staff. The systems vary, but the net effect is that a difference in 5 percent of the check in tip may only amount to $1.50 to $2 in the waiter’s pocket. Critics of the tip system often point to the notion that a diner’s theoretical power to reward good service or punish bad is illusory. Others point to the fact that in reality, cultural norms mean diners “punish” bad service minimally. One of the leaders of the anti-tip movement is Jay Porter who, until 2013, ran both The Linkery and El Take it Easy restaurants in North Park. At The Linkery, Porter added an 18 percent “service charge” to each check and forbade wait staff to accept tips. At the latter, however, he employed a conventional tip system. Porter believes this provided a laboratory environment with which to evaluate the comparative merits of the two approaches. Writing about the experiment, Porter concluded that at The Linkery, “our food improved, probably because our cooks were being paid more and didn’t feel taken for granted.” Business, he says, improved and servers were making more money than before, primarily—if counter-intuitively—”because eliminating tips makes it easier to provide good service.” At El Take it Easy, Porter contends there were struggles on all counts (but particularly quality of service) and tipping was the difference. At Bracero in Little Italy, Van Horn is implementing a hybrid system. While a portion of each server’s tips will be dedicated to a tip pool, the server will keep the majority. “That friendly competition is exactly what we want,” he says. What about the kitchen staff? Van Horn recalls a saying from his Navy days: “Choose your rate, choose your fate.” He notes that in restaurants there are different motivations for deciding between careers in the front and back of house. At present, there’s no consensus on compensating various staff. But the moderate confusion diners feel when faced with a check and tipping is a factor that could be taken out of their hands.